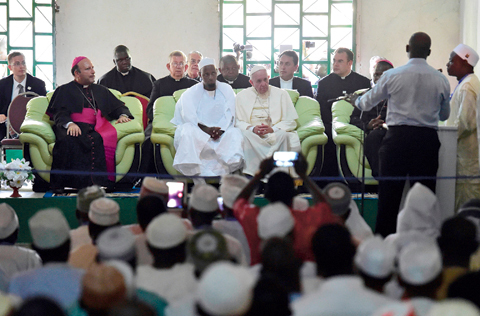 BANGUI, Central African Republic: Pope Francis yesterday said Christians and Muslims were “brothers” and urged them to reject hatred and violence as he visited a mosque in the Central African Republic’s capital which has been ravaged by sectarian conflict. On the last leg of a three-nation tour of Africa, the leader of the world’s 1.2 billion Catholic visited a flashpoint Muslim neighborhood in Bangui on what was the most dangerous part of his 24-hour visit. Thousands of people gathered at the roadside, cheering as his popemobile drove down the red dirt roads. As his vehicle passed, many waving Vatican flags and dressed in long traditional robes, ran down the road after it, an AFP correspondent said. “Christians and Muslims are brothers and sisters,” he said after meeting Muslim leaders at the Koudoukou mosque in the PK5 district, the last Muslim enclave in Bangui where tensions remain high after more than two years of violence. “Together, we must say no to hatred, to revenge and to violence, particularly that violence which is perpetrated in the name of a religion or of God himself,” he said. The pope later flew out of Bangui to head back to Rome, ending his first trip to Africa that also took in Kenya and Uganda. Francis’ message of peace and reconciliation appeared to have made a powerful impression, with a group of Muslim rebels turning up to join tens of thousands watching a papal mass at the capital’s Barthelemy Boganda stadium. In extraordinary scenes just before the pope’s arrival, two pickup trucks pulled up in the middle of the crowd and a group of Muslims from PK5 leapt out, all wearing T-shirts bearing the pope’s image, an AFP correspondent said. As they pushed through the crowd in an area where Muslims usually do not dare to venture, people cheered and applauded, shouting: “It’s over” in reference to the inter-communal hatred that has blighted the country since a 2013 coup sparked a cycle of revenge attacks. Several hundred people had packed into the mosque, including a number actually living there after being forced out of their homes by the violence. “We are very proud to welcome him, the pope is not only for the Christians, he is a servant of God for all Central Africans,” said Ibrahim Paulin, a spokesman for the displaced. Francis said his visit to CAR “would not be complete if it did not include this encounter with the Muslim community,” saying all those who believed in God “must be men and women of peace”. He was greeted at the mosque by the Grand Imam Nehedi Tidjani, who once again said Muslims and Christians must “live together”. Perched high on the mosque’s minarets were armed UN peacekeepers from the MINUSCA force who were keeping a close eye on the crowds as a helicopter buzzed overhead. At the edge of the district, armed Muslim rebels stood alert in front of wooden barricades, watching out for any threat from Christian vigilantes. Despite the tight security, the visit took place in a relaxed atmosphere. “We thought the whole world had abandoned us, but not him. He loves us Muslims too. I’m very happy,” said Idi Bohari, an elderly man standing by the side of a road in a crisp white robe, unperturbed by the clouds of dust whipped up by passing UN vehicles. Nicole Ouabangue, whose husband was hacked to death with an axe, said she had heard many speeches before but the pope’s words were “different”. “Pope Francis has more influence. If there is anybody who can resolve our problems on Earth, it is him,” she said.